A self-proclaimed artistic centipede, Roberto Tjon A Meeuw gives multitasking a whole new meaning. He’s known for his amazing art installations made from recycled materials. His most popular work to date has to be the 9-meter-long “Piská;” the recycled fish in the Scharloo neighborhood, which is prominently displayed in Parke Leyba. 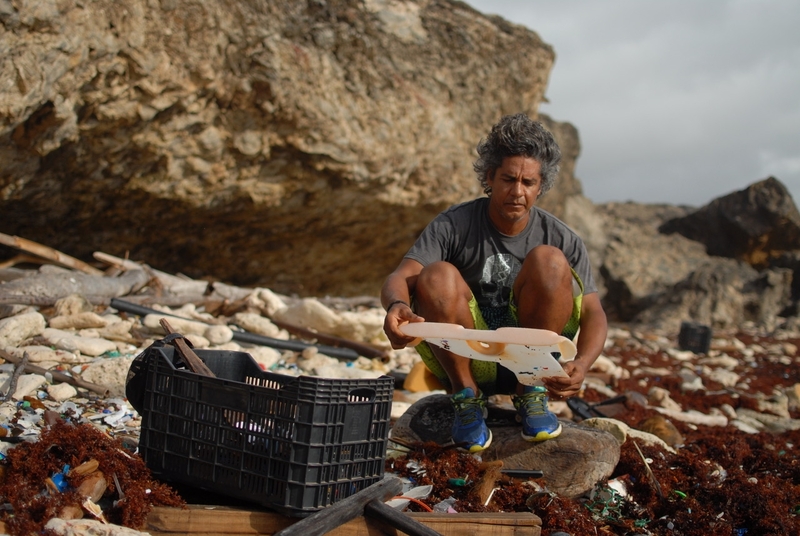 Roberto’s inspiration for this piece came from the massive marine pollution plaguing our coastline. His solution to the problem was to pick up the trash and use it to build this huge plastic artwork. He even got school kids from all over the island to be part of the project. 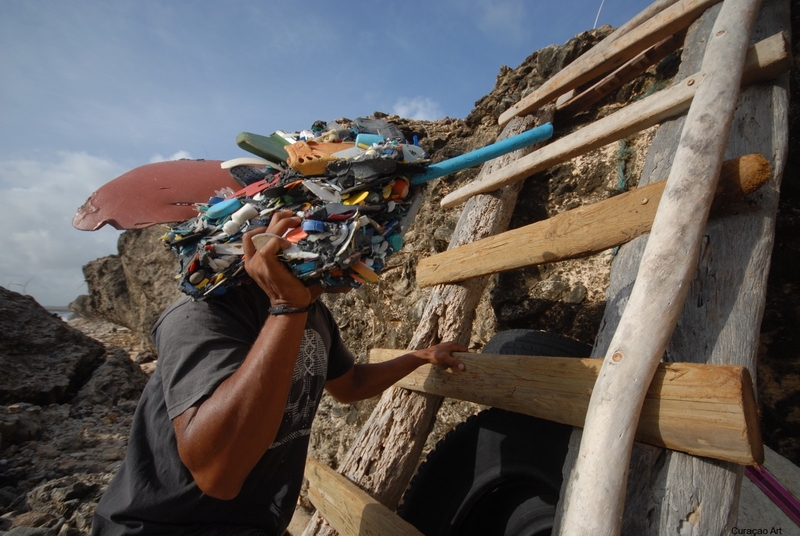 Today, the recycled piece of art stands tall as the mascot of Scharloo Abou, Curaçao’s creative bario. This stay-at-home dad is able to create anything he sets his mind to, from furniture, paintings, installations, to sculptures and even murals. You’ll often see him collaborating with local and international artists. However, he likes to spend most of his time at home. If we time travel back to 2003, we would meet a humble Roberto, living and working as a plumber in Surinam. He has an urge to design and create art but hasn’t fully given into his artistic inclination. With a bit of luck, a friend offers him the opportunity to exhibit 20 art pieces, and he grabs the opportunity with both hands. He uses recycled shutters, doors, and windows to paint on, establishing his very own technique. The unique exhibit becomes an instant success in Surinam, because it was something nobody had ever seen before. It also becomes a point of no return for Roberto, and this turns out to be his inevitable introduction to life as a full-time artist. Roberto’s whole artistry is centered around his home, where he can spend time with his kids and simply create. “I love being at home. My sons get to experience how I work and see my creative process with their own eyes,” says Roberto, who has gotten used to working on different projects at the same time. “I can be in the middle of repairing my car, but also be fixing something around the house, while I am finishing a project or creating a new piece of art.” The gender-role defying artist knew long before he had kids what kind of father he wanted to be and believes wholeheartedly that a man should spent most of his time out in nature and with is family. “I want my sons to grow up loving nature as much as I do, therefore, I know I really needed to be a part of their lives, to guide them and to help shape their development. This also feeds right back into my art.” Being a father and an artist are not mutually exclusive for Roberto. “I knew from the get-go that if I was going to create something, my mission had to be to wake people up,” says the recycling artist. Roberto’s work revolves around getting the world back on track. His designs are sustainable by design, since he’s worried that on Curaçao, we are not treating mother nature the way we should. He actively tries to incorporate his love for nature and sustainability in all the work he does for his clients. Everything he makes, even when it’s commissioned, needs to have a touch of recycling in it. He is constantly searching for human connections through his work and ultimately wants kids to think about ways to fix the earth’s problems. Some of Roberto’s work can be seen at the Dive Center Scuba Do at Jan Thiel Beach and in the Ser’i Fortuna neighborhood. 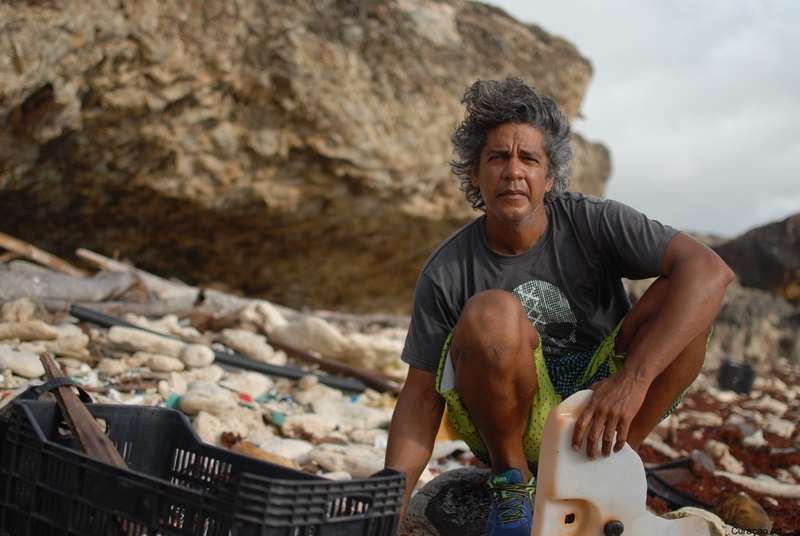 His most recent work is on display at the Curaçao Museum. “The Ministers” is an exhibit of fish made from waste material he collected along the Northern shore. The work of art refers to politicians in general, who have no clue how to handle the world’s pollution problem. “Politicians are responsible for the well-being of the people and are key to solving a lot of the world’s problems. This is why the fish bear their name,” explains Roberto. This exhibit is a direct message to the local government, as well as a way to try to get more people involved.